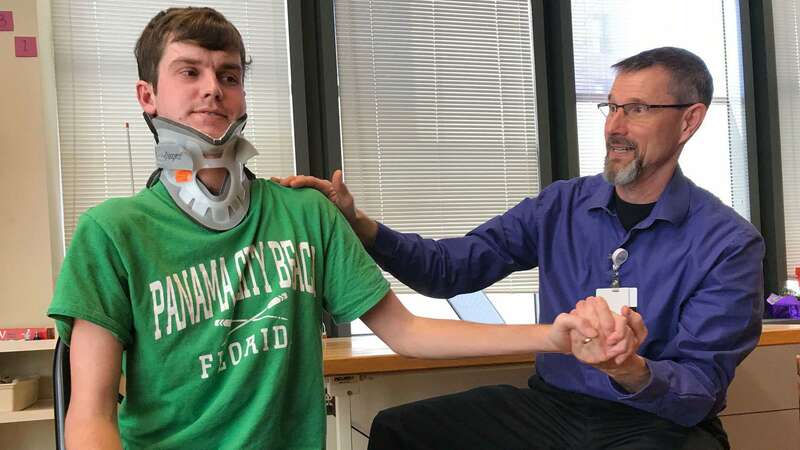 A young man from Plymouth, who was internally decapitated in a January car accident, has survived the traumatic injury that separated his skull from his spine, defied the odds, and is living a fairly normal life. This is a story about the team of doctors who helped save Brock Meister, 22, including the neurosurgeon who treated this almost always devastating injury, and was the same doctor who helped care for Brock when he was diagnosed with, and survived, a brain tumor six years ago. Every member of the medical care team who treated Brock, from the paramedics at the scene of his accident, to the emergency room doctors and nurses, to his neurosurgeons, played an instrumental role in saving this courageous and determined young adult. This is also a story about a resilient young man who has overcome more medical obstacles than many people do in a lifetime, who has remained positive throughout, and who has carried the burden with grace. Brock is back to spending time at the lake with family and friends and doing almost everything he enjoys most about summer. But he admits that recovering from a harrowing and life-altering accident is not easy. He continues physical and occupational rehabilitation twice a week as his body continues to heal. On Jan. 12, Brock carried a container of chicken wings to his vehicle after finishing a late dinner with friends in Plymouth. After dinner, Brock started out for Lake of the Woods, south of Bremen, to stay overnight at his grandparents’ house. His friends planned to meet him there. Brock set his leftovers on the seat and fastened his seat belt next to his friend who was driving. They were about 10 minutes from his grandparents when the vehicle suddenly hit a patch of ice on 4th Road near Plymouth-Goshen Trail. Brock vividly remembers what happened next and how those few seconds changed the trajectory of his life. Brock’s truck after the accident. He was nearly ejected from the passenger side. The back of the vehicle swung out on the ice and struck a ditch. The impact caused the vehicle to tip over and roll onto the passenger side. Even though they were only traveling at 40 miles per hour, Brock was thrown sideways toward the door, his head punching and shattering the window, his body leaving the seat and momentarily becoming airborne. “Half my body was out the window,” Brock remembers. The driver pulled him back in. The vehicle flipped upright again and onto its wheels, before slowly rolling to a stop on the side of the road. Their friend, Ryan Topper, who had also been at dinner and was driving ahead of them, knew something was wrong when he looked out his rearview mirror. He didn’t see Brock’s headlights for a minute, and then saw the vehicle turned around, facing the other direction. The door was jammed and wouldn’t open. But feeling an adrenaline rush, he ripped it open and called 911. Jenna Meister was relaxing at home that evening with her husband, Travis, in Plymouth, when her phone rang shortly before 11. She answered and received news no parent ever wants to hear. Jenna said it felt like it took a lifetime for she and Travis to reach their son. Within 15 minutes of receiving the call, they quickly got back in their street clothes and drove out to the scene of the accident. They arrived to find paramedics at work on Brock. The first responders had already carefully stabilized Brock, extricated him from the vehicle and placed him on a stretcher. His head and face covered in blood, Brock was shaking and kept repeating how he was cold. He could feel his arms and legs, and even move them, but he felt tremendous pain in the back of his neck from his skull shattering the window. Albeit in a quiet, soft voice, he was able to mumble a few words to his mom. In true Brock fashion, he asked if she knew what happened to his chicken wings. First responders rushed Brock to Memorial Hospital of South Bend’s emergency room, where Dr. Joe D’Haenens examined him. “EMS did a great job getting him to us as quickly and safely as possible,” Dr. D’Haenens said. Brock’s X-ray showing the extent of injuries that needed repair. Once Brock was stabilized, his initial imaging workup revealed a traumatic atlanto-occipital dislocation – essentially a complete separation of the skull from the spine or internal decapitation. The emergency medical staff told Jenna, who works as an office supervisor at Beacon Orthopedics and Sports Specialists, that they were contacting the neurosurgery team. But already, she and Travis realized their son had defied the odds. “He’s here and he’s alive, and that in itself is a complete miracle,” she told family and friends that night as they gathered to support her at the hospital. The true incidence of atlanto-occipital dislocation, is unknown as the vast majority of patients die instantly or en route to the hospital. Jenna was told Brock is only the second patient ever brought to Memorial Hospital alive with this injury. There are only isolated survivors across the country. But making it to the hospital safely is just the beginning. There was a lot at stake in the hours ahead. This type of injury has a very high mortality rate. In conjunction with the traumatic bony separation and dislocation of the skull from the spine, the blood vessels supplying the brain and the spinal cord itself are commonly injured. These injuries can cause significant neurological deficits and often prove fatal. So Dr. Shaikh said his first thought was about the amazing EMS team who saved this accident victim’s life. So Dr. Shaikh would perform the surgery in South Bend. Not long after that decision was made, Brock began having difficulty breathing. In addition to his other injuries, he had developed a slowly enlarging hematoma in his neck. This was now compressing his airway. He needed a breathing tube. But in his case, that would not be easy. “Any manipulation of the head and neck as would otherwise be done for a typical intubation procedure could have the potential of causing a devastating injury.” Dr. D’Haenens said. “We called Dr. (David) Isaacson, an ENT surgeon, to help with a tracheostomy.” Once his airway was secured, he was carefully taken to the intensive care unit for further monitoring while plans for surgery were made. Meanwhile, Brock’s family members had been gathering in the waiting room. As many as 40 cousins, aunts and uncles, other family and friends were together at any time, comforting Jenna and waiting on updates as Brock prepared for surgery. Knowing how much her son had already been through, Jenna could not help but question why God would allow this series of events to unfold in Brock’s life. This was not the first time Brock received potentially devastating news, she said. Brock was 16 years old and a Bremen High School sophomore when he started having blurry vision and headaches, severe headaches. “I was having trouble taking notes in school,” Brock said, but doctor appointments didn’t offer any answers. The morning of Oct. 12, 2012, Brock’s pediatrician found that Brock’s eyes were not tracking right. An eye doctor determined that Brock had severe optic nerve swelling and he was referred to the Memorial Hospital ER to have an emergent MRI. Brock with a therapy dog during cancer treatment in 2012 at Memorial Hospital. The MRI revealed a large mass within Brock’s pineal gland in his brain. Because of the size of the mass, Brock developed moderate hydrocephalus and had to be sent by ambulance to Riley Children’s Hospital in Indianapolis. He underwent surgery for a shunt to relieve the pressure in his head; the tumor was blocking the normal pathway for cerebral spinal fluid to travel. After performing a minimally invasive biopsy, Dr. Joel Boaz determined that Brock had a malignant brain tumor called a grade III germinoma, located in the center of his brain. This made surgical removal out of the question. Brock’s parents were heartbroken. As a newborn, Brock spent the first few weeks of his life in Memorial NICU. He was not breathing at birth; CPR was required to revive him. He had two seizures and bleeding on his brain from the lack of oxygen during birth. “So I didn’t understand why God would save him then, just to be put through cancer,” Jenna said. He received four cycles of chemo over 12 weeks at Memorial Hospital. His tumor responded, shrinking to the size of a grape. Proton radiation therapy followed at the IU Proton Center in Bloomington, and the tumor cells eventually died. Because of his laid-back personality and positive disposition, Brock never let cancer slow him down. He never complained during treatment, and the only time he missed a full day of school was because of treatments or appointments. “Even after receiving the devastating diagnosis, I knew in my heart if anyone could survive, it would be our Brock,” Jenna said. Now, six years later, he faced another uphill battle. But through an amazing twist of fate, he would face that battle with someone connected to his past. Early Saturday morning, Dr. Shaikh met Brock and his mom. Before he explained procedures and answered their questions, the surgeon told them his name sounded very familiar. So Jenna told him about Brock’s brain tumor and about their time at Riley. As soon as they mentioned Dr. Boaz, the neurosurgeon smiled. Jenna couldn’t believe their luck. Dr. Shaikh found his own peace with performing the rare operation after two important things happened. First, in order to perform the surgery, he needed the proper equipment and instrumentation. That started with calls to the Memorial OR and Medtronic hardware representative around 3 a.m. This type of case is extremely rare, and as a result most hospitals don’t routinely stock all of the needed equipment. Thankfully, Dr. Shaikh said, the OR coordinated with medical device maker Medtronic to get the equipment into the hospital and sterilized for use quickly. “I believe the rep literally drove to Indianapolis and back in the middle of night to get it,” he said. Dr. Shaikh also needed another neurosurgeon to assist in the OR and called his Beacon partner and friend, Dr. Neal Patel. With the equipment ready and the team in place, Brock was wheeled to the operating room around noon. Once asleep, the surgeons spent the next hour-and-a-half working on Brock’s pre-operative positioning – essentially working to reduce the fracture to re-align his skull and spine. Dr. Shaikh manipulated Brock’s head while Dr. Patel held Brock’s body. Together, making ever-so-slight movements, and with live fluoroscopy and real-time spinal cord monitoring, they re-established near normal anatomic alignment. At this point, the surgery itself could begin. The surgeons made an incision in the back of Brock’s neck and dissection was carried down exposing the back part of the skull and cervical spine. Then they carefully placed a skull plate and spinal screws above and below the fracture. These were connected with a rod on each side, providing fixed stabilization across the injury. Spinal cord monitoring after the surgery confirmed that the spinal cord signals were good. Dr. Shaikh said Brock awoke moving everything well and was taken to Intensive Care. Discharge papers showing extend of injuries. Working with therapy each day he continued to progress, from sitting up in a chair the day after surgery and walking in the hallway a few days later. He was then transferred to the inpatient rehab unit at Memorial for continued rehab and, after the trach was removed, was released in February. Brock was released from the hospital in February and wore a neck brace until late spring. He still experiences some right arm difficulty and neuropathic pain in his lower extremities. He continues to visit Memorial Outpatient Therapy Services for outpatient occupational and physical therapy. Naturally, Brock experiences good days and bad days. “It’s likely if you see Brock he will have a smile on his face. It’s because he enjoys seeing you,” Jenna said. “While he is my blessing, please realize you are simply his blessing. But most days for Brock are filled with physical pain and are just plain tough. My heart aches for him. He wants to be better and I want him to be better. Dr. Shaikh is hopeful that Brock will go on to lead a fairly normal life. Brock before getting his neck brace off. Last week marked six months since the accident. Jenna posted a note to Brock on her Facebook page that she wanted to share with those reading this story. She wants everyone to know that Brock continues to heal, beating the odds one day at a time. Brock enjoying summer with his family. “Today marks six months since your near fatal car accident. For six months I have sat back and watched you in complete amazement. Amazement that you have overcome a “universally fatal injury”. Yes, those are the words used in your medical records. As your mom, those words are both gut wrenching and bittersweet. I personally have watched the hell you have gone through physically and emotionally and I hope you know if I could take any of it away, I would. In a heartbeat, no questions asked. Brock and his mom, Jenna.